What’s The Yellow Pole with the Orange Flag? Home | Forespar Products in Use | What’s The Yellow Pole with the Orange Flag? 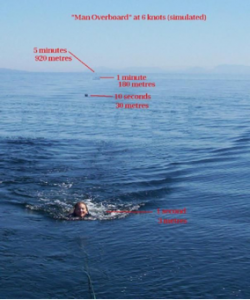 That head in the water is getting away from you at 10 feet per second, and you’re only going six knots. So, in the five seconds it takes you to react, she’s already 55 feet away. 10 seconds, she’s 110 feet astern. If there’s any kind of sea running or a foot of chop, how long before you lose sight of that head, life jacket or not? Just for training, wad up a paper bag or some wrapping paper, or blow up a balloon to about the size of your head. Toss it over side when you’re under way, and time yourself. It can be hard to find. That’s why savvy sailors have that yellow pole with the orange cylinder at the base up along the rigging at the back of the boat. It’s a MOB (Man Over Board) pole. The MOB pole is attached to the stern pulpit at the base, and to the backstay, enclosing the flag at the top. 50 or more feet of line (yellow) is tied to the float on the pole, and the other end to your horseshoe buoy. The picture below shows the basic pole in two parts for shipping, and how it might be mounted. Deploying the pole is simple – a quick reach back from the helm, lift the pole from its seat, and drop it, reach over, and throw the horseshoe – not necessarily in that order – as long as it’s done quickly. 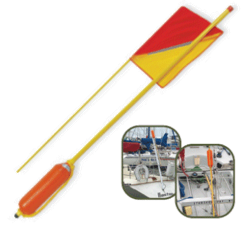 Now, there’s a high-visibility flag and pole six to ten feet high in the immediate vicinity of your overboard crew. The skipper and crew can track the person the water using the flag, making it much easier to take in sail and get the boat around and back to that flag. You will come up on the windward side of the flag, grab the pole, and reel in the horse shoe with the errant crew member. A number of sailboats, particularly racers, have an installed horizontal tube, open at the transom. The pole in inserted flag end first, with the line coming out of the transom to the horseshoe. The horseshoe is thrown, and the resulting drag pulls the pole out toward the person in the water. Many skippers attach a light to the pole. You may not see the pole/flag at night, but you will see the light. Obviously a good idea, and one we’ve used for years of cruising and offshore racing. Get the pole and install it. You may never need to use it, but if you do, you will need it. Mike Dwight March 30, 2016 Category: Forespar Products in Use, General Content. Tagged: flag, man overboard, MOB pole, pole, safety.